In 1976 I was lucky to be living in Hawaii in a beautiful little town near the beach on Oahu. In 1979 I was going to the University of Hawaii for a Masters program, while raising my daughter and enjoying the wonders of a tropical island. Sadly my marriage was falling apart and creating a shadow over this idyllic life, so my friend took me to a meditation center where I received Shaktipat from a great Indian guru, and my life immediately began to transform. From a Yuppie wife and mother, I became a mystic able to heal people by intention, able to spin in the air, and understand a thousand things simultaneously while comprehending great secrets of the universe. 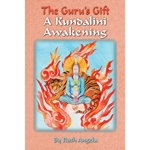 Because of the disruption this created for my family and my need to somehow explain it, I have been researching the phenomena of Kundalini Awakening since 1993 as I had no idea what had happened in 1979. After 20 years of working on this manuscript during my vacations and holidays, I am satisfied that I have explained for myself what occurred and I trust this helps others who read my book. Events over two strange years have taken 20 years to understand with the mind. This is my report. It is my hope this discovery and relentless research gives readers some understanding of just how amazing the true human being is and can be. This mystery of Kundalini Awakening has been kept hidden from the general public in the West for thousands of years, but it is time now for the veils to be removed. A new age is here since 2012, and many more Star Beings are here to transform our planet. More and more people are waking up as the codes of our DNA are activated. It is time for this book to reveal what turns out to be GOOD NEWS for humanity. However, the process is difficult, and not for everyone, but since it comes without our choice in most cases, this information may help with the process. It can be compared to a roller coaster ride. Sometimes one can be up at the top looking at the amazing vistas of joy and bliss, but then come the plunges into troughs where one may feel one is never again going to feel ‘normal.’ The process can be dramatic, but we have the feminine Kundalini Shakti showing us the way, which, when all the “dirty chi” is transformed, reveals our heart as the true guide of our lives and the path to transcendence. Video of the author now up on the BLOG reading the Chapter 7. Scroll down.